Our dummy data will be a unit square. 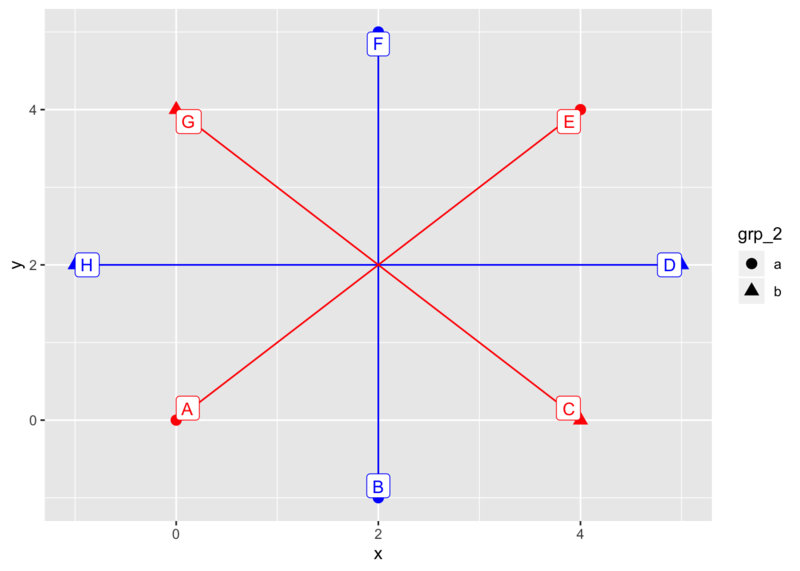 We labeled its points as common in maths: counter-clockwise. We may want to join the points with segments. 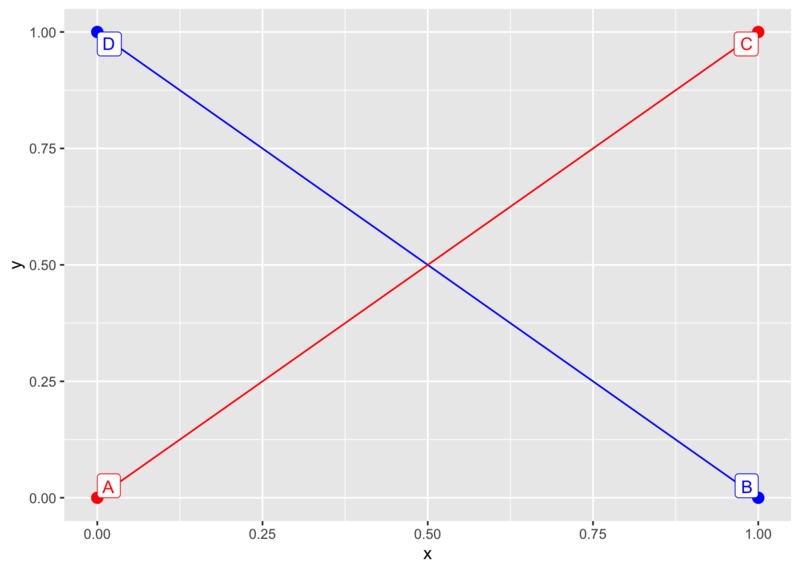 By default, the line geom inherits the color argument from the call to ggplot. The group aesthetic is a combination of all discrete mappings, in this case the default group for the line geom will be the same as for the colors. We may want to link the points with segments joining together. One option is to overwrite the color mapping for this layer. Another option is to overwrite the silently set group aesthetic and setting it constant. 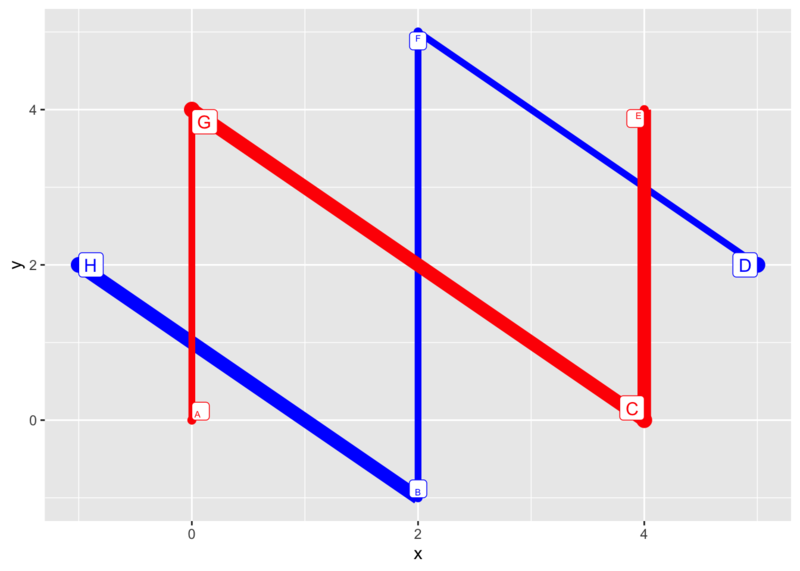 This way the segments will inherit their color from their (left) neighbour point. 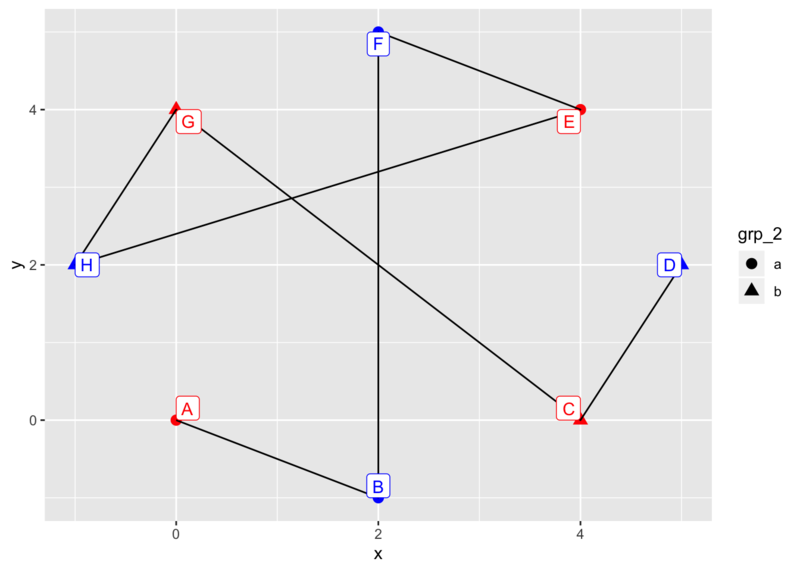 What order are the points linked? 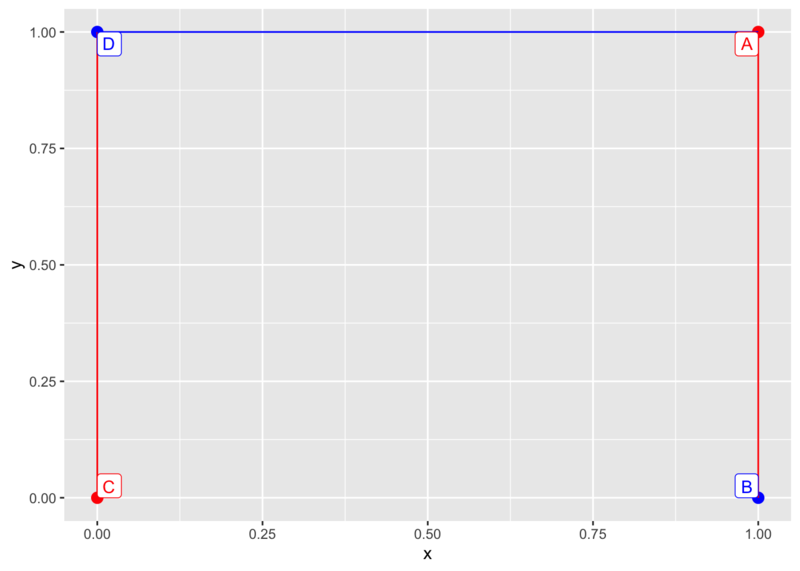 Now left-to-right, and order of appearance in data is coincidentally the same order as the points appear in the dataset, so we have to make further experiments. 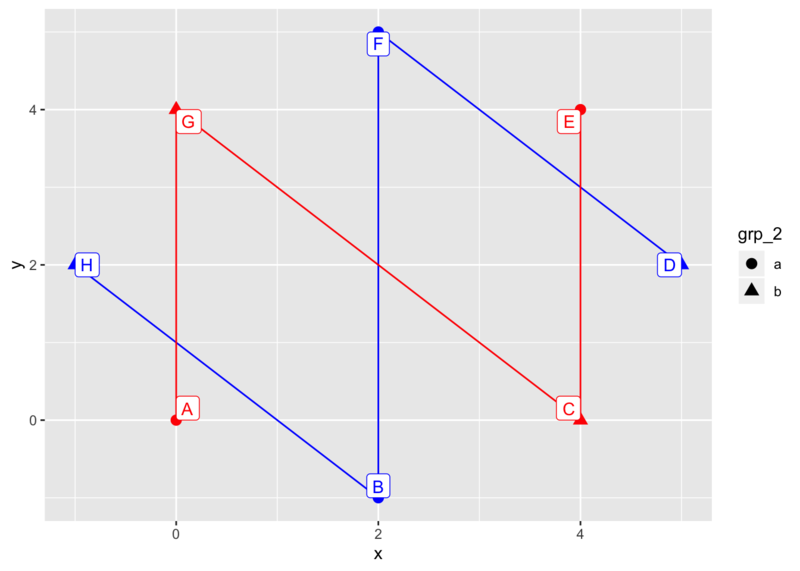 We can safely conclude that the order in which the points are linked is left-to-right, order of appearance. 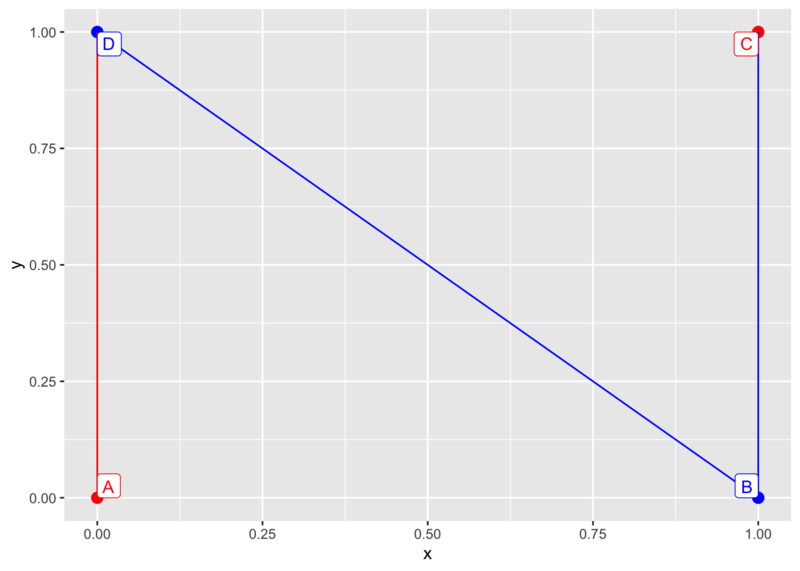 A slightly different case when the aesthetic defined in the ggplot call is not applicable to lines. It will still effect the silently set group aesthetics. We can still overwrite the pch aesthetics in the geom_line call thus silently unsetting the group variable. 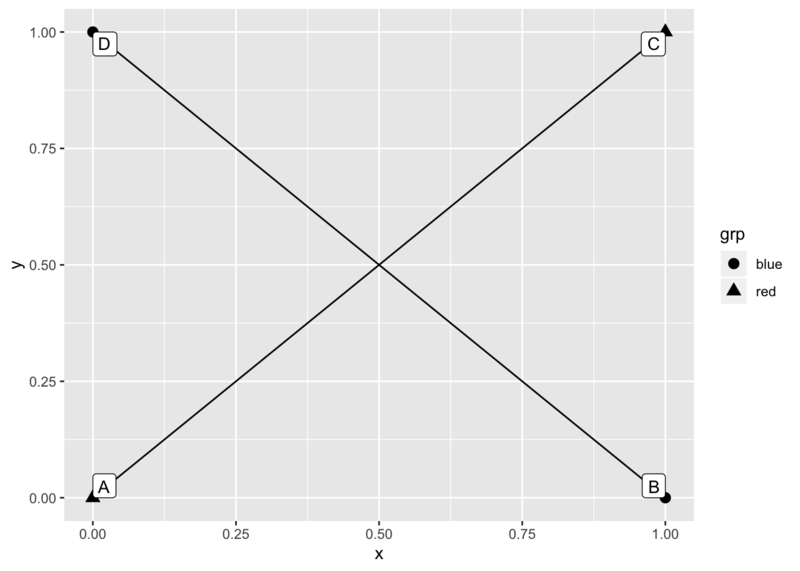 However in this case explicitly setting the group aesthetics is inarguably more clear. We even got a warning saying “Ignoring unknown aesthetics: shape”. What happens when the group variable is a combination of more mappings? 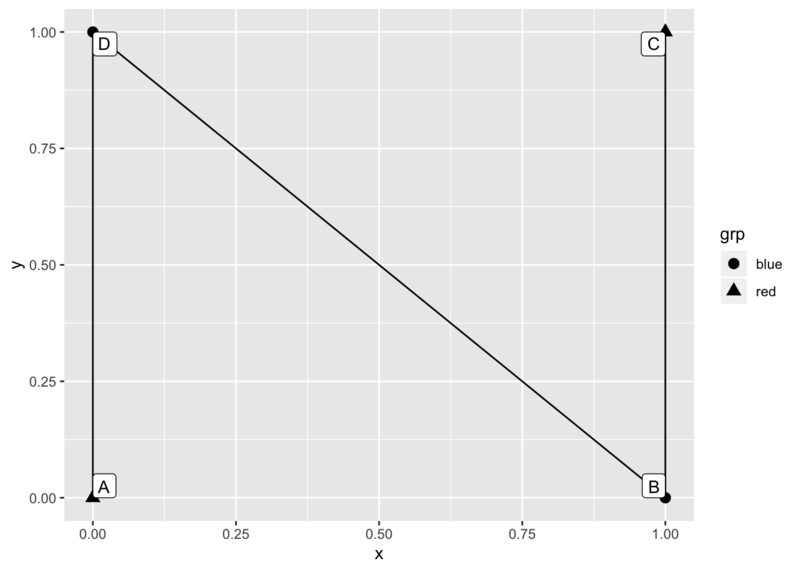 To join the points in a group with line segments we need at least two points so we need to define a slightly bigger dataset to experiment with. 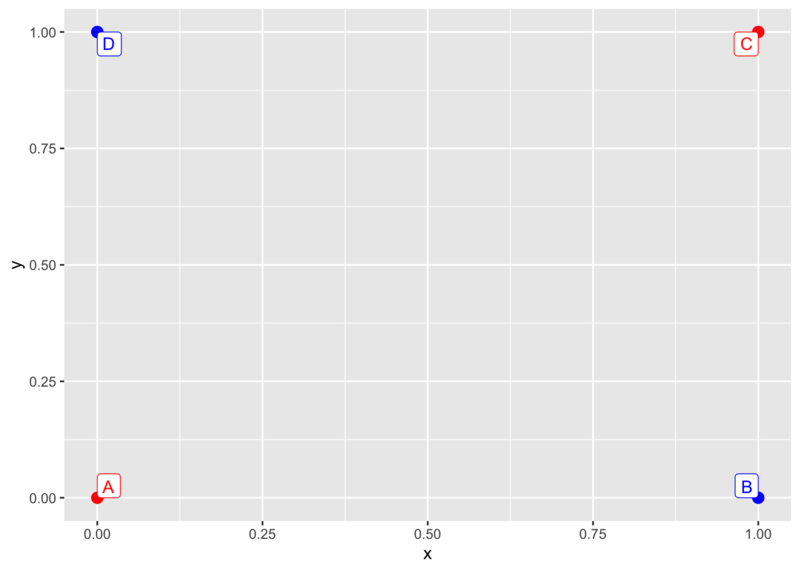 By default we will have 2 group of 4 points linked together: one group for each value of the discrete variable used in the aesthetics call in ggplot. 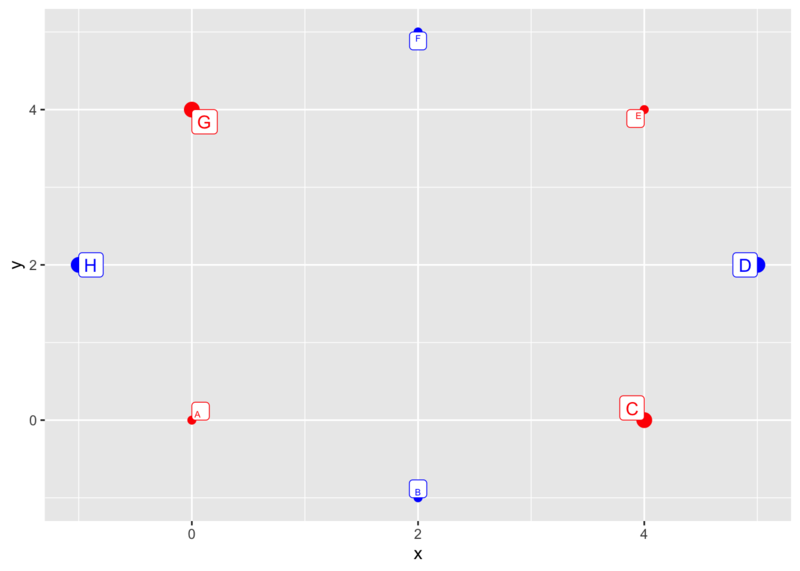 By default we have 4 pair of pairwise linked points: one for each combination of the two discrete variables used in the aesthetics call of ggplot. 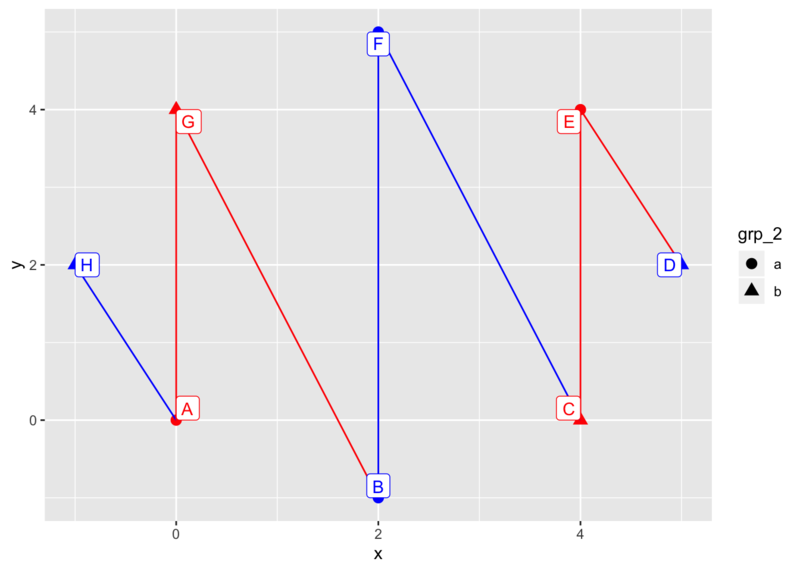 We can also set the group aesthetics to constant or combine these two approaches. What happens if we specify the group variable outside aes? The order in which the segments are linked has been changed. But to what? Let’s find out by targeted experiments. This way in the background we still have the group in aesthetics: it has effect although we overwrote the effect of joining lines, we did not overwrote every effect of the aesthetics mapping. 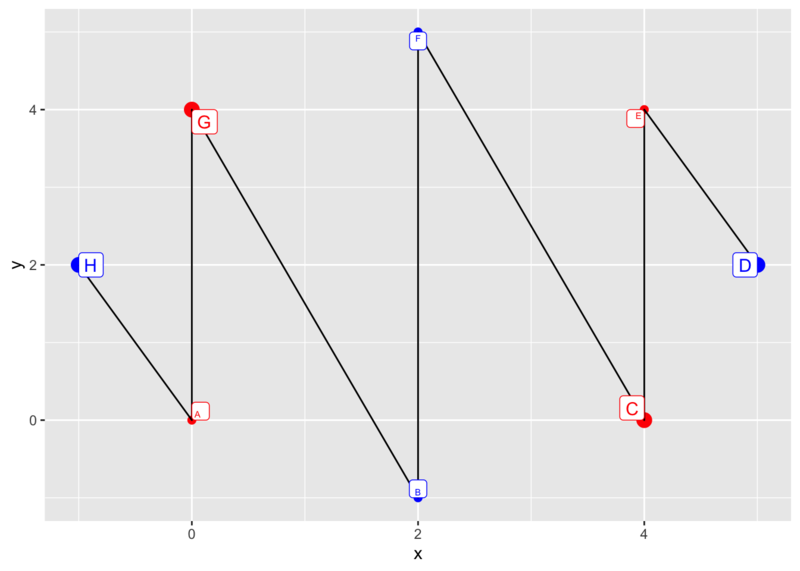 So the order in which the points are linked: first levels of the group, then left to right, then order of appearance in dataset. Check for yourself with the above examples! e.g. 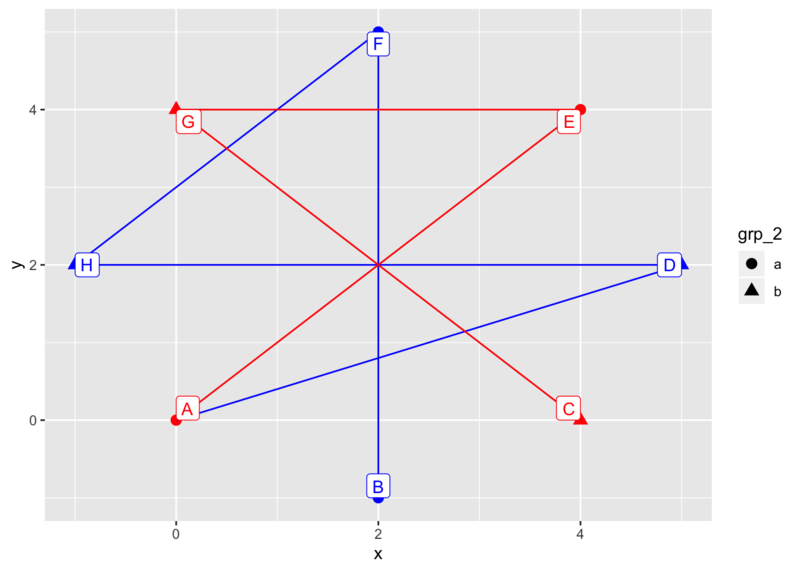 blue < red, circle < triangle. 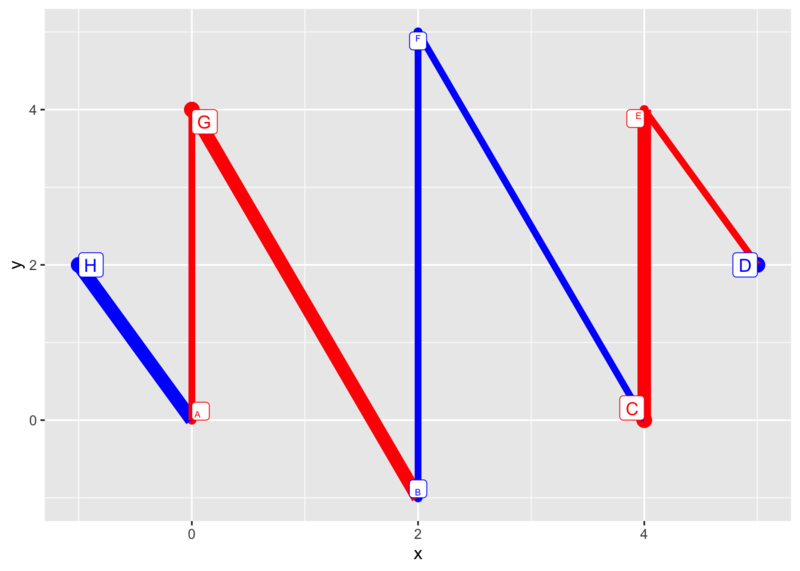 Group is the interaction of discrete variables set inside aes unless explicitly overwritten.